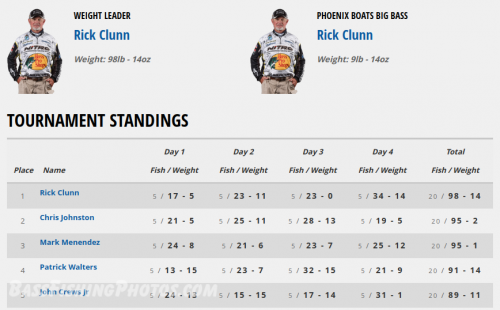 Northeast Bass Fishing Forums - Bassmaster Elites Series Live Now! Topic: Bassmaster Elites Series Live Now! Bassmaster Elites Series Live Now! First tourny from ST John River. Re: Bassmaster Elites Series Live Now! WOW! There are some monsters being caught today. Gonna be an iteresting weigh-in!! 34 lbs. 14 oz.for Clunn!!! During Classic week BASS would have a Federation (now BASS Nation) Night where they would honor top clubs and people in the Federation; man/woman of the year etcetera. All Classic contenders were busy getting ready for the tournament EXCEPT for Rick Clunn who always made time for the grass roots guys. Will always remember that and love that he's still going strong. It was amazing to watch Rick Clunn bag just shy of 100 lbs. over the course of 4 days in the ST. Johns River this past weekend!! That man right there has the st johns dialed in for sure! That is total craziness. 30+ pound bags is insane! Big win for Paul Mueller who is a guide out on Candlewood. Did it with style pulling in some monster spotted bass on a technique near and dear to my heart that kills it on candlewood. Page created in 0.07 seconds with 29 queries.